(Phys.org)—As an elementary particle, the electron cannot be broken down into smaller particles, at least as far as is currently known. However, in a phenomenon called electron fractionalization, in certain materials an electron can be broken down into smaller "charge pulses," each of which carries a fraction of the electron's charge. Although electron fractionalization has many interesting implications, its origins are not well understood. "We have been able to visualize the splitting of an electronic wavepacket into two fractionalized packets carrying half of the original electron charge," Fève told Phys.org. "Electron fractionalization has been studied in previous works, mainly during roughly the last five years. Our work is the first to combine single-electron resolution—which allows us to address the fractionalization process at the elementary scale—with time resolution to directly visualize the fractionalization process." The researchers first analyzed the propagation of a single electron in the interferometer's outer one-dimensional wire, and then when that electron fractionalized, they could observe the interaction between its two charge pulses in the inner one-dimensional wire. As the researchers explain, when the original electron travels along the outer wire, Coulomb interactions (interactions between charged particles) between excitations in the outer and inner wires produce two types of excitation pairs: two pulses of the same sign (carrying a net charge) and two pulses of opposite signs (which together are neutral). The two different excitation pairs travel at different velocities, again due to Coulomb interactions, which causes the original electron to split into two distinct charge pulses. The experiment reveals that, when a single electron fractionalizes into two pulses, the final state cannot be described as a single-particle state, but rather as a collective state composed of several excitations. For this reason, the fractionalization process destroys the original electron particle. Electron destruction can be measured by the decoherence of the electron's wave packet. "There has been, during the past years, strong efforts to control and manipulate the propagation of electrons in electronic conductors," Fève said. "It bears many analogies with the manipulations of the quantum states of photons performed in optics. For such control, one-dimensional conductors are useful, as they offer the possibility to guide the electrons along a one-dimensional trajectory. However, Coulomb interactions between electrons are also very strong in one-dimensional wires, so strong that electrons are destroyed: they fractionalize. Understanding fractionalization is understanding the destruction mechanism of an elementary electron in a one-dimensional wire. Such understanding is very important if one wants to control electronic currents at the elementary scale of a single electron." "The Hong-Ou-Mandel interferometer can be used to picture the temporal extension (or shape) of the electronic wavepackets, which is what we used to visualize the fractionalization process," Fève said. "It can also be used to capture the phase relationship (or phase coherence) between two components of the electronic wavepacket. "This combined information fully defines the single-electron state, offering the possibility to visualize the wavefunction of single electrons propagating in a one-dimensional conductor. This would first provide a complete understanding of the fractionalization mechanism and in particular how it leads to the decoherence of single-electron states. It would also offer the possibility to test if single electrons can be protected from this decoherence induced by Coulomb interaction. Can we suppress (or reduce) the fractionalization process by reducing the strength of the Coulomb interaction? We would then be able to engineer and visualize pure single-electron states, preserved from Coulomb interaction. "The next natural step is then to address few-particle states and electron entanglement in quantum conductors. Again, the question of the destruction of such states by Coulomb interaction effects will be a crucial one." And I don't think the word elemental in reference to elemental particle means what we think it means, there are way too many elemental particles. I think there is some underlying simplicity we don't understand yet. Note that Wal Thornhill has been arguing that a non-elemental electron CAN WITH EASE EXPLAIN GRAVITY for some time now. "Simply stated, all subatomic particles, including the electron, are resonant systems of orbiting smaller electric charges of opposite polarity that sum to the charge on that particle. These smaller electric charges he calls 'subtrons.' This is the kind of simplification of particle physics required by Ockham's razor and philosophically agreeable, though it leaves unanswered the real nature and origin of the subtrons. In this model, the electron cannot be treated like a fundamental, point-like particle. It must have structure to have angular momentum and a preferred magnetic orientation, known vaguely as 'spin.' There must be orbital motion of subtrons within the electron to generate a magnetic dipole ..."
This model satisfies Einstein's view that there must be some lower level of structure in matter to cause resonant quantum effects. It is ironic that such a model requires the electric force between the charges to operate incomparably faster than the speed of light in order that the electron remain a coherent particle. It means that Einstein's special theory of relativity, that prohibits signalling faster than light, must be repealed. A recent experiment verifies this. Electromagnetic waves are far too slow to be the only means of signalling in an immense universe. Gravity requires the near-instantaneous character of the electric force to form stable systems like our solar system and spiral galaxies. Gravitationally, the Earth 'sees' the Sun where it is this instant, not where it was more than 8 minutes ago. Newton's famous law of gravity does not refer to time. But mediation requires propagation, and finite bodies should be incapable of propagation at infinite speeds since that would require infinite energy. So instantaneous gravity seemed to have an element of magic to it. There's no reason the universe has to be simple or make sense. It's just as likely true that it's very complicated and doesn't make much sense. Not sure what you mean, the quantum theory of electronic angular momentum is complete, and accounts for everything you mentioned. That description suggets that you don't understand what the "balloon" shapes represent. They're probability densities corresponding to a particular set of three quantum numbers (n,l and ml) .. the latter two account for ang. mom. The rest of that is something of a hot mess of unnecessary speculation .. all the physical factors you mentioned are accounted for by standard QM theory. First, this experiment did not do anything with "electrons" as most people think of them. It was a solid state experiment dealing with "quasiparticles" - electronic excitations in condensed matter - which happen to carry a single electron worth of charge. It may seem surprising that the "fundamental unit of charge" has apparently been split into parts, but as the authors point out in the (freely available) paper, this is because the initial wave function of the quasiparticle gets split into a superposition of several different electron-hole excitations; no violation is implied. Second, as docile implied above, even for free electrons in vacuum, such "splitting" of the wave function is completely consistent with the predictions of quantum theory. 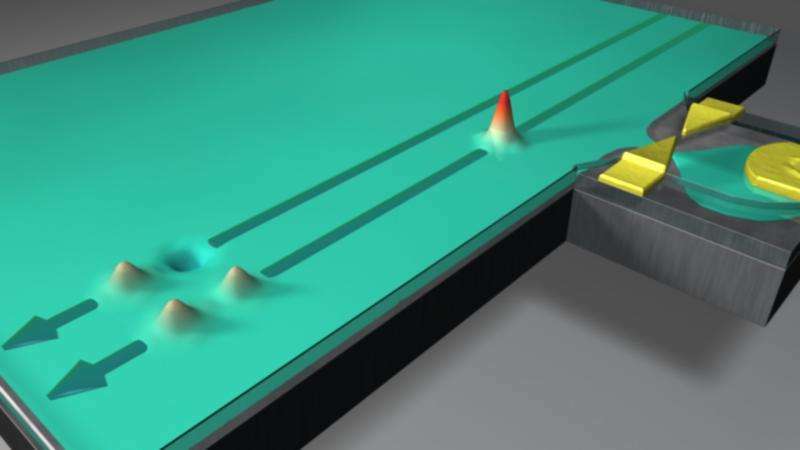 It has recently been demonstrated for single photons, with the two parts of the "split wave packet" separated by a space-like interval prior to measurement; it's only a matter of time before the experiment is repeated for free electrons. @DarkLordKelvin, yes from what I've read in the past there are several named quasi-particles and I've often wondered at what point the full charge of say an electron, completes the transfer. That is to say, does the electron transfer gradually and not one single movement, although the gradual transfer on the quantum scale would seem instant to us. As a layman the gradual transfer is the impression I get when reading. This would then account for what appears to be a 'splitting'. Or am I barking up the wrong tree ? Ha! The electron is actually 4 smaller particles in one. There is a strong force/property that holds them together and prevents them from flying apart. 1/4 charge quasiparticles (bad name since they are true particles) are known to exist. I predict that there is something peculiar about the fractional charges, something having to do with the absolute axes of the universe. Strange effects will be noticeable depending on the time of day or day of the year. The absolute orientation of the lab and/or the apparatus itself is important. There is interesting physics to be discovered here. You heard it here first. LOL. There are twenty orders of magnitude between the scale of quarks and the Planck scale, about which we know very little, as it's rather difficult to obtain data at those scales. I think the presumption that we can declare *any* particle we can observe as elementary is probably wrong. In this study, the researchers appear to be observing the break-up of an electron into fractionally-charged, unstable and short-lived components. The apparent parallel to the break-up of protons and neutrons into fractionally-charged, unstable, and short-lived particles is rather obvious, isn't it? So the standard model needs to be updated? Do you mean that the electron has some similar structure to that of the Proton etc. What is this property called and where can I read about it? "So how big is an electron? It expands to fit the container it's in. That may be a positive charge that's attracting it--a hydrogen atom--or the walls of a conductor. A piece of wire is a container for electrons. They simply fill out the piece of wire. That's what all waves do. If you try to gather them into a smaller space, the energy level goes up. That's what these Copenhagen guys call the Heisenberg uncertainty principle. But there's nothing uncertain about it. It's just a property of waves. Confine them, and you have more wavelengths in a given space, and that means a higher frequency and higher energy. But a quantum wave also tends to go to the state of lowest energy, so it will expand as long as you let it. You can make an electron that's ten feet across, there's no problem with that." Almost everything about physics needs to be updated. That's all I can say for now. A specific example would be enough how you want to update physics. With numbers and observations, please (make sure they fit with all previous observations, too). Otherwise this is just a hot air statement. Those seem like reasonable questions to ask, and they get at the heart of the phenomena of "decoherence", which is essentially how the different "parts" of a quantum system "lose memory" about how they were "prepared". Please note the quotation marks above, which are intended to reflect that the language I used doesn't really capture the full scope of what is represented in the mathematics. Auntie challenged Ichisan, "A specific example would be enough how you want to update physics. With numbers and observations, please (make sure they fit with all previous observations, too)." I don't know how Ichisan wants to update physics, but I know how *I* want to do it. I want two-body experiments to validate or falsify Special Relativity's reciprocal time dilation. If it's falsified, our entire cosmology needs a do-over, because it means we'll need to back out time dilation from red shift measurements to obtain true velocities and distances. Time dilation has been proved again and again; but two-body time measurements have only been done on GPS - and what that proved is directional time dilation, not reciprocal. Time for the satellites slowed; time for Earth did not. That fits with General Relativity, but no similar proof of SR's reciprocal time dilation has been shown. Auntie, SR is important, but it's also flawed. Here's the deal: it's a two-body solution. Further, it stipulates that a universe-wide solution for all moving objects is impossible; everything depends on frames of reference. But that's horseshit. The universe itself has no difficulty determining absolute positions and velocities and time dilation for its objects. The universe obeys a universal reference frame, and it solves the math - math which we don't grasp. In a two-body model, there's no problem, but when you have a gazillion bodies, all moving relative to one another, SR simply doesn't work. Basing our cosmology on it without evidence that its reciprocal time dilation is true is a leap of faith, maybe a wrong one. Of course that's a crank viewpoint, and I can't say it without wearing my tinfoil hat and clutching my mylar balloon. Hog wash ! First, charges come in thirds (1/3) Note the two quarks. Second, there are three preons that build every particle and each either carries the 1/3 charge or none at all. If there is a half around it is because of the other 1,000,000 things that can happen in nature, not because a half is fundimental. So why can an electron-wave (and for that matter a photon-wave) not split up to move through two slits? Where are you Feynman now that we need you? So why can an electron-wave (and for that matter a photon-wave) not split up to move through two slits? It can, of course .. that's standard QM. Where are you Feynman now that we need you? Beg Pardon, I was under impression electrodynamics was very much within QM to a very high degree already ? Speed with respect to what ? Inertial or non-inertial reference frames, isnt that also in QM in any case re special relativity effects, eg Why gold is the colour it is ? Not clear what you mean by 'complex actions', a reference please to identify just what you are trying to say, ie Any physics to back up that claim ? So with a bit of luck we will see a 'white board' floating around out there with the math....Oh come on! The universe obeys/follows what ever rules/processes that 'it' has to. WE USE MATH to describe the rules/processes that we are able to discover and the problen is that one or more might depend on another (or more). Scientists have discovered some of the rules for QM, cosmo etc and as far as I'm concerned, I'm grateful...I wouldn't be able to write this post if scientists had got it all wrong. Mimath224, I'm grateful, too. I think we've achieved remarkable progress in discerning how the universe works. I certainly do not think there is a 'white board' floating around out there with the math. I'm curious why you felt the need to set up a straw man argument and then dismiss me on the basis of it. I do think we haven't nailed down reciprocal time dilation with experimental evidence, and I think it's likely that a two-object solution to relative motion in time and space which relies on 'framing' to exclude all else is not an adequate description of reality. @Urgelt because I interpreted your post that way. Perhaps rephrasing some of your lines. For example, '...I do think we haven't nailed...' goes from the particular to the general, would be better as ' ...We haven't nailed...'. I might have argued against your post but dimiss you? I wouldn't even try to do that to you or anyone else. According to what I read SR has been confirmed (not proven) by experiment but, as you indicate, it's GR that takes over in cosmology but I can't find your reason. Mine comes from the very basic notion of invariant line element which both the algebra of SR and the tensor of GR strive to conserve. Finally both SR & GR are involved in Time Dilation. GR treats time dilation as directional; e.g. of two moving bodies, only one experiences time dilation. SR treats time dilation as reciprocal; e.g. of two moving bodies, both experience the same time dilation relative to each other. Contemporary cosmological measurements which rely on red shift are assuming that SR's reciprocal time dilation is true, which means that time dilation does not distort red shift, since both objects are dilated equally. Many, many measurements have shown that time dilation is a thing. But the only experiments which measure time on *both* moving objects is GPS. If you use SR's reciprocal time dilation in GPS, you get erroneous geopositions. Time dilation has been shown to be directional for GPS satellites. The satellites dilate; Earth does not. There have been zero experimental demonstrations of reciprocal time dilation. See the problem? SR is elegant and persuasive, but in science, evidence is the gold standard. Only there isn't any. Note that he isn't insisting that reciprocal time dilation is false, and he isn't insisting that the Absolute Lorentz Transformation on which his work is based is true. He's just raising questions and thinking through the what-ifs. Which are, as it turns out, enormously consequential. If we should be adjusting red shift for time dilation to obtain true velocities and distances, then our entire cosmology needs a massive do-over. Whether coincidence or not, when he reevaluated a sampling of type 1a supernovae red shifts assuming time dilation is directional, the requirement for dark energy vanishes completely. The universe is expanding at the rate of Einstein's cosmological constant, and it's not accelerating. SR free of non-IRF is virtually nonexistent. From accepted SR view ea observer will see others clock slowing down but, of course by the same amount so then there is no net change, ie Relative => No IRF change etc, correct I expect ? Many, many measurements have shown that time dilation is a thing. But the only experiments which measure time on *both* moving objects is GPS. If you use SR's reciprocal time dilation in GPS, you get erroneous geopositions. Well, since the SR and GR effects are additive, and not contradictory, I don't think that can be correct .. do you have a reference for what you are talking about? Since it is by definition a transient and relative effect, resulting in no net discrepancy between identical clocks, how would you propose to measure it? You could use two atomic clocks in spacecraft in counter-propagating orbits, I suppose (although that sounds dangerous! ), but how would you compare them? You would need to account for the relativistic effects on the signals sent between the two craft, and I wonder if that wouldn't mask the effect (I haven't worked out the math)? Kelvin, I furnished the link to Phys.org's article about Kipreos. There's a link in the article to his paper in PLOS-One. I've read it. You can do the same. He discusses GPS in the paper. Mike, I'm not enough of a physicist to defend or attack reciprocal time dilation, and neither is my intent. I'm only pointing out that reciprocal time dilation hasn't been experimentally confirmed. Time dilation has been confirmed. Directional time dilation has been confirmed (GPS). Nobody has investigated reciprocal time dilation. And that oversight will require a big do-over in cosmology if it turns out that reciprocal time dilation isn't true. I'd prefer it if you will not hold me accountable for devising the experiments. If there aren't better experts available than me to tackle that experimental problem, science is in deep trouble. Mike, the only potentially (but not likely) useful thought I've had about an experiment re: testing reciprocal time dilation is this. It's moving faster than anything else we've ever put into space, and it's a hefty distance from the Sun's gravitational well. It has a clock. We can talk to it and evaluate its signal spectrum. We have clocks on Earth. It's not much affected by any gravity, so GR can be ignored. Potentially, we might make something of that. What it lacks is a precision clock, and the velocities are small, relativistically speaking, so precision probably matters. I have absolutely no idea if anything useful could be learned by studying Voyager. OK, I read that PLOS-one paper you linked, and it did not support your apparent claim that the GPS corrections are incompatible with SR. In fact, I found the link below that explains (as I suspected) that both GR and SR must be taken into account to get the precise correction that is actually used (about 38 us/day). Did I somehow misunderstand what you were trying to say? With regard to the paper, I think it's quite interesting, and I agree that the current "state of the art" does not seem to be able to distinguish between predictions of SR and ALT. I have some serious issues with the idea of the Earth-centered inertial frame being "preferred", but I must admit that currently they are more philosophical than physical. I guess a possible test might involve spacecraft on trajectories around the Earth and Moon (say), which both pass through the same Lagrange point, perhaps? t=τ√1+r²ω², t=τ/√1−2GM/rc² & ω=1/R√2GM/(rc²-2GM) Any help?? Kelvin, you misread the paper. Kipreos is *not* proposing an Earth-centered frame. He is proposing an *absolute* frame that works everywhere for every object, from any location in the universe. Further, he writes: "...time dilation between inertial reference frames is reciprocal for SR and directional for ALT." I can't put it any plainer than that. I am not an expert, but as far as I have read QM, an electron can only move through one slit at a time when you look at it: This surely must mean that it is impossible to see it splitting into two parts.. In this study it is claimed that an electron IS observed to split into two parts. Does this not violate the Copenhagen interpretation of QM? 1) As I said early on, this is completely consistent with Copenhagen, but I also understand your issue now .. the observation of "splitting" here is also indirect, much like the inferred wave-behavior of the particle through the slits. 2) Also, despite the (mis)interpretation above, this does not deal with "single electrons", but rather solid-state excitons with an "electron's worth" of charge. Absolutely not .. you need to re-read it I guess ... he says explicitly in the conclusions "The most compelling hypothesis is that the ECI functions as a PRF (preferred reference frame) because it is the local center of gravitational mass". The next sentence explicitly allows for "multiple PRF's". He also explicitly addresses, and rejects as inconsistent with available data, the possibility that the CMB could serve as a PRF, and he also addresses and rejects the idea that there is an "ether" that serves as a PRF (c.f. the first section of "Theoretical Considerations"). Further, he writes: "...time dilation between inertial reference frames is reciprocal for SR and directional for ALT." I think you overestimate how much of a difference that makes for actual observations. Multiple PRFs is just a way of slicing up an absolute universal frame so we can consider specific cases using accessible math. The universe itself is still in one frame, according to ALT. I'm *not* advocating for ether theory. (I'll forgive you for suspecting it, since ether theory nuts are common here.) The *only* advocacy I'm pushing is the need for experimental testing of reciprocal time dilation. You wrote, "I think you overestimate how much of a difference (choosing directional time dilation over reciprocal time dilation) makes for actual observations." Again, you didn't read the paper carefully enough. Kipreos did a quick-and-dirty analysis of its impact, and he found that the universe expands at the rate of Einstein's cosmological constant with no acceleration. Dark Energy goes away! That alone is a huge difference in our cosmology. But nearly every measurement which relies on spectrum shifting will have to be recalculated if time dilation is directional. That's not anywhere in this paper .. it seems to me that you are either extrapolating, or incorporating knowledge/inferences from external sources. All Kiperos says about the "universal frame" is that it cannot be co-moving in AST; he still allows for multiple PRF's that are centered on centers of gravitational mass. In fact, since there is no "center of gravitational mass" for the universe (at least as far as we know), Kiperos's work actually argues AGAINST an single, absolute, "universal" reference frame, although he doesn't make that point explicitly in the paper. To me, the biggest issue with his theory is how to handle cases where different PRF's "merge" or "diverge", or even how they influence each other in general. For example, the Earth impinges on the PRF's of the Moon and Sun. Again, you didn't read the paper carefully enough. Why do you say that? I don't think anything I've posted has been contrary to or misinterprets what is written in the paper. That's a difference in interpretation, using the SAME observations .. that's why this is so tricky. All of our observations are consistent with BOTH "standard" cosmology (i.e. with "dark energy"), and now apparently with AST without DE. On the other hand.. I think AST at least has to get some "Occam's razor" points, being the simpler theory, and not requiring the ad hoc addition of DE to fit observations. What the hell is AST? Kelven, you skimmed, but you didn't pay attention and saw what you expected to see. Otherwise you'd never conclude that this is no big deal for cosmology, and you'd not be using erroneous acronyms. Kelven, you skimmed, but you didn't pay attention and saw what you expected to see. You are rapidly eroding my patience with this nonsense. Science is more than a casual hobby for me; I suppose you may be projecting your own perceived flaws onto me, but I try very hard not to waste anyone else's time making stupid, avoidable errors, even on an online physics forum. From the paper(last sentence of "Theoretical Considerations" section):"The combination of ALT and PRFs linked to local centers of gravitational mass will be referred to as absolute simultaneity theory (AST)." He also refers to AST extensively in the Conclusions. Perhaps it was you that skimmed the paper? and you'd not be using erroneous acronyms. I never did that either. I put thought and effort into my comments, and I'd appreciate a little reciprocation. Kelvin, you did write, "I think you overestimate how much of a difference that makes for actual observations." Then you denied it by writing, "I never came close to saying or implying that." Your arguments are all over the map, dude. Absolute simultaneity is a huge departure from SR; can we agree on that much? And Kipreos doesn't posit the Earth as the center of the universe. It's a preferred reference frame only because that's where we are. you did write, "I think you overestimate how much of a difference that makes for actual observations." Yes, and you have apparently never noticed the OBSERVATIONS part. Try re-reading my last few posts .. I already provided additional context to clarify what I meant. No, you MISINTERPRETED my statement as applying to interpretation/analysis, when I clearly specified it was about observations in plain language. Please don't attribute your reading comprehension issues to me .. my arguments have been consistent from the start. Who said that he did? It's a preferred reference frame only because that's where we are. Yes, and all of my comments have been consistent with that view. The only thing that matters in any of this discussion is the need to test SR's reciprocal time dilation. If SR's version of time dilation is falsified, then we will have a great big physics brouhaha. Kipreos didn't remake physics in his paper on the basis of a 'what-if.' He gives only the barest glimpse of what it will mean if time dilation is directional and the universe should be regarded through an absolute simultaneity lens. I have no idea whether ALT is correct. But I do want to find out. I hope the physics community will rise to this challenge and test this aspect of SR.
We're all accustomed to presuming that there is no gravitational (or otherwise) center of the universe, but I have to wonder, does that remain true if absolute simultaneity has its way? The universe has distributed mass moving on various vectors. Couldn't a gravitational center be calculated, once SR's objections are brushed aside? Dear Forum, I owe you an apology. My recent exchange with UrgeIt was predicated on the belief that this paper by Edward Kiperos (a biologist) we have been discussing had been properly vetted by physicists: it has not, and it appears to be pseudoscience (at best). I had assumed that PhysOrg would have sussed out such a glaring flaw before posting their summary article, and I assumed PLOS One was a physics journal (although I had never heard of it), otherwise, why are we talking about it? Sadly I was mistaken on both counts ... I forgot this is the internet, where BS abounds and is often presented as "solid science". Anyway, after thinking more about the author's claims, specifically the problem with rectifying multiple preferred reference frames I mentioned a few posts back, I did some searching for critical reviews of the paper. I found them, and it is considered to a work of little or no merit within the community of experts who understand this stuff. PLOS-One is a science journal and it does publish physics papers. Papers are reviewed for technical adequacy. Credentials are always interesting, but science proceeds on the basis of evidence, not authority. The 'critical reviews' on various blogs - I've only been able to find a few - do not address Kipreos' core point. Time dilation has been demonstrated experimentally. Directional time dilation has been demonstrated experimentally (GPS). Reciprocal time dilation has not been demonstrated experimentally. Observing reciprocal time dilation will require experiments which provide clocks on two moving objects (for example. Voyager 1 and Earth). Nobody has tested SR in this way and shown reciprocal time dilation is a fact. If Kipreos were practicing pseudoscience, he'd declare certainty for absolute simultaneity. He never does that in his paper; he offers it as a possibility not excluded by evidence. And that is accurate. The wave function can split up but the electron can not. There is no meaningful difference between the two, at least according to "standard" (i.e. Copenhagen Interpretation) quantum mechanics; the wave function is a complete representation of the electron. A more carefully phrased way to express the sentiment you may have been trying for might be, "although the wave function can split up, it is not possible to detect a 'fractional electron' ". Define "technical adequacy" please, because that certainly sounds like a poor standard for publication. I have published in and reviewed for several scientific journals, and the standard there is that a paper must be technically perfect (as in it makes no detectable errors), and it must "advance the field" ... part of that latter point is that authors must be able to put their work into the context of the CURRENT literature (Kiperos does not). *sigh* it's not about authority, it's about expertise .. physics may be Kiperos's hobby, but he doesn't have the training and expertise of a professional physicist. Special relativity is supposed to be reciprocal, where both parties will experience the same time dilation, but all the examples that we have right now can be interpreted as directional time dilation," Kipreos said. "If you look at the GPS satellites, the satellite time is slowing down, but according to the GPS satellites, our time is not slowing down—which would occur if it were reciprocal. Instead, our time is going faster relative to the satellites, and we know that because of constant communication with the satellites. That's actually wrong .. time on the satellites is going FASTER than on earth because of general relativity. His failure to address general relativity anywhere in his work is one of the most telling flaws in his paper ... the details of GR are MUCH harder than SR.
@mytwocts, DarkLordKelvin etc. per Urgelt 'That's all I can say for now'. Perhaps Urgelt works at area 51...oh retract that, area 51 has gone public now. Oh well...the point is what are you afraid of? I have 'ideas' too and as naive as they might be I have mentioned them on various 'particle' threads. For example, gamma photons (from experiments) producing e+ & e- & vice versa. To me that suggests that the composition of the 'particles' are 'photonic'. That would explain their wave nature also. I might also extend this other 'particles' and that might explain matter waves. But I have no math to support this idea nor any other support but at least I've given my idea some substance upon which others can criticise. For example, how do I express the strong force (gluon) in terms of photons...I don't think I can. So let's have no more 'That's all I can say for now', if you have a theory let's hear it. If you haven't got the confidence to explain how can expect others to listen. I could accept your derision if I were expressing certainty that reciprocal time dilation is wrong. I've said no such thing. Neither has Kipreos, oddly enough. But I'm mindful of David Deutsche's advice: good science is built around theories that are 'hard to vary.' They make concrete predictions; they can be falsified. SR satisfies this criterion, because it makes precise predictions that can be tested. So does ALT, actually. An experiment will falsify one or the other. I think it's likely that it will falsify ALT. But who would argue that it's an experiment not worth conducting? KIpreos' paper is definitely not an all-encompassing exploration of the implications of ALT, should it be experimentally validated. But it's a mistake to assume that he is pointing to GPS as evidence for ALT. He's merely pointing out that it's *not* evidence for SR, which we use in our cosmological measurements. SR's reciprocal time dilation is untested. If you take away nothing but that, it's a worthwhile paper. KIpreos' paper is definitely not an all-encompassing exploration of the implications of ALT ...But it's a mistake to assume that he is pointing to GPS as evidence for ALT. It is a mistake to assume he knew what he was talking about ... his comments about GPS strongly suggest that's not the case ... do you acknowledge his GPS claims were wrong? SR's reciprocal time dilation is untested. If you take away nothing but that, it's a worthwhile paper. Not really .. why should we have to wade through a sea of malarkey to take away such a simple message? You keep saying it " deserves experimental verification", but experimental physicists don't like to have their time wasted any more than anyone else; they'll wait for a correct theory. Since Kiperos isn't an expert, the likelihood he screwed up something important is quite high. I understand that GPS involves both SR and GR. Can you not see that the requirement for correcting for the SR component suggests directionality rather than reciprocity? In this study, GR is excluded because everything in the experiment is located at the same place in Earth's gravity well. When they accelerated lithium ions to 1/3 the speed of light, using a rather clever method that let them treat the ions as precise clocks, they found time dilation affected the speedy particles, but not the stationary clock. They confirmed directionality, not reciprocity. Look, I don't have a dog in this hunt. Whatever is true, is true, period. I just want reciprocity to be experimentally verified. I can't find any two-clock experiments which do it. I have no idea if Kipreos' simultaneity ideas will work. It will not surprise me to learn that he's goofed up something, maybe a lot of somethings. It's a very radical departure from SR, that's for sure. My primary interest is in this very specific question: are spectrums from cosmological objects shifted by time dilation, or aren't they? Experimental confirmation of reciprocity would seem to be key to answering that question. But if it has already been done, where is it? This is right at the center of a lot of confusion. The wave function represents all the physical information accessible but it is a mistake to equate it to the electron. The electron is a point particle as far as anybody knows, not a charge cloud that can be split. You are quite simply wrong about that, and there is 100 years of experimental evidence to demonstrate that. For example, there would be no way to explain electron diffraction or the two-slit experiment (within the Copehagen Interpretation), if your statement were correct. Also, do you realize that a "point particle" with finite mass is a singularity where the mass density becomes infinite? That really seems more reasonable than simply accepting a theory (standard Q.M.) that has never failed an experimental test? No, I can't, actually. Do you have a source that explains your argument precisely, with math? I don't think so .. not unless they somehow "read" the lab-fixed clock from the moving frame. "Quite simply"? What is simple about wave particle duality? How does the explanation of diffraction require anything but the interpretation that psi^2 predicts the distribution of electrons? You know what? I think I was too hasty when I said you were "wrong" .. I actually agree with what you wrote, I have just gotten so used to needing to qualify and contextualize everything when arguing with cranks that I didn't stop to consider what you were (probably) claiming. It sounds like you're taking the standard instrumentalist view that every single electron that has actually been detected has behaved like a point particle, therefore, as far as actual observations are concerned, it's reasonable to describe it as such. I have actually made this argument (many times), so it's a little embarrassing to admit I missed it coming from someone else. I had assumed you were talking about notions of the electron before it's detected; that was the context in which I made my original comment. Ah now we are talking. It happens to me too. I have reasons based on self interaction that this is a necessary assumption for the Schrödinger equation for electromagnetically interacting particles to be valid. Hmmm ... I guess I don't see what you mean there .. isn't all of that sorted out by quantum field theory? The self-interaction energy of the electron is what gives rise to the (experimentally measured) Lamb shift of the 2S & 2P states in the H-atom, after all. It's been a while since I went through those derivations, but I distinctly remember using the electron wave function (Dirac "bra" & "ket", specifically) throughout. I guess I am not sure how that squares with your statement above that it's a necessary assumption that the electron is a "point-particle", or else problems arise with the Schrodinger equation. With respect to GPS' apparent directionality for both SR and GR corrections, Kelvin wrote, "No, I can't, actually. Do you have a source that explains your argument precisely, with math?" He went on to contradict my interpretation of a Canadian SR experiment with this: "I don't think so .. not unless they somehow "read" the lab-fixed clock from the moving frame." The second observation sheds light on the first. To demonstrate reciprocity, we have to be able to read the *other* clock from both objects. I have no idea if GPS can do that. It was not done in the Canadian experiment, so my interpretation of it is falsified by his question. I still don't see where the evidence is for reciprocity. Is it an untested feature of SR? Is Kipreos right about at least that much? annual visiting professor, while retaining his primary position in Berlin. ether hypothesis has certainly been an empty one at first sight. . .
a view is inconsistent with the fundamental facts of mechanics". The thesis was apparently submitted in 1958 and this part placed on the net in 2009. It would seem to me Prof. Kiproes has obtained his ideas via this kind of route and is hardly original. Kind of supports what you have said. The second observation sheds light on the first. To demonstrate reciprocity, we have to be able to read the *other* clock from both objects. I have no idea if GPS can do that. Nor do I .. hence the question. There are other issues, such as whether the satellites are really valid inertial reference frames ...I don't think SR's prediction of reciprocal dilation holds unless both clocks are in IRF's undergoing relative motion. I still don't see where the evidence is for reciprocity. Is it an untested feature of SR? The symmetric Doppler shifts of spectroscopic lines may give a hint there, but I am not sure. Kelvin wrote, "The symmetric Doppler shifts of spectroscopic lines may give a hint there, but I am not sure." I'm not sure, either, which is why I'd like to see experiments which explicitly test reciprocal time dilation. Maybe SR is fine. Maybe there's no problem with cosmological measurements. I'd be perfectly happy if that's the result. I've been thinking more about your earlier point, that to prove reciprocity, we need to read the clocks of both moving objects from the other object. But I'm also (and especially) interested in whether time dilation shifts the spectrum from a distant moving object, or not. Current relativity theory says no, it's not shifted. Can we get at that question without reading clocks of both moving objects from the other object in an experiment? If we can, and if we discover that spectrum is shifted by time dilation between two moving objects, then that alone falsifies SR's reciprocal time dilation. When an electron splits in two? Try harder. There's lots of them! The self-interaction energy of the electron is what gives rise to the (experimentally measured) Lamb shift of the 2S & 2P states in the H-atom, after all. It's been a while since I went through those derivations, but I distinctly remember using the electron wave function (Dirac "bra" & "ket", specifically) throughout. The Lamb shift is due to the _difference_ in electron self interaction between two states that are otherwise degenerate, while the self interaction itself diverges. That is what you expect for a point particle. Can you point out which term in the self-interaction Hamiltonian for an H-atom requires/enforces that the electron is a point particle? I have just think about it in terms of the wave-function, but it's possible I am missing something. Please correct me if I'm wrong but I thought the Lamb shift was due the electron interacting with the vacuum and /or the em field. That is the H atom interacting with vitual photons. Didn't R. Feynman find some result due to 'infinities' and a cutoff factor which I thought, presently, was unsolved. Would be interested to see the solution if it has been calculated.